Percee P photo by Max Herman. Stones Throw Records founder Peanut Butter Wolf appeared to be ecstatic on stage during the Chicago leg of his crew’s 2K Sports Bounce Tour (Holiday Edition). But this wasn’t necessarily the case when Wolf was up there all alone. In the finale of the night, the label head/selector manned a DVJ, looking subdued while mixing an assortment of music videos onto a large projection screen to the crowd’s vocal approval. Only during select moments did he break his calm focus: When he played Black Moon’s “Who Got Da Props,” he looked up and told everyone, “I’m glad you know this.” But he seemed most content, admiring the talent that stood before him, when the rest of Wolf’s Stones Throw cohorts were performing. As the jovial Peanut Butter Wolf probably realized, this was no average night of hip-hop. While J.Rocc unfortunately couldn’t make the show, a bulk of the Stones Throw roster appeared as scheduled, in addition to a surprise opening DJ set by original N.W.A. member Arabian Prince. Variety was no doubt a key to the success of the evening. From the straightforward rhyming of M.E.D. to the gruff raps and presence of Guilty Simpson, there was a good amount of no frills MC’ing going down and, initially, a bunch of booming J Dilla beats concurrently blasting out of the speakers. When Madlib appeared after Percee, the show took a turn towards the eccentric. Sporting shades and a gigantic mood ring, Madlib began by performing mostly old material such as the cratediggers anthem “The Return of the Loop Digga.” He also garnered laughs by repeatedly asking where his helium-voiced alter ego, Quasimoto, was at. While rapping, this producer/MC appeared a bit shy, and often faced sideways towards the audience. But when he brought out his Supreme Team partner Karriem Riggins that timidity quickly vanished. After a little vocal warm up, Riggins sat behind the drums and Madlib behind tables and mixer as the pair knocked out an impromptu jazz-inspired session. It was here, with the Beat Konducta tweaking various knobs and Riggins providing free-flowing live rhythms that the show seemingly came to a climax. Then Peanut Butter Wolf stepped up. While he didn’t look as excited as when his friends and fellow artists were performing, his montage of music videos brought the night to an impressive close. 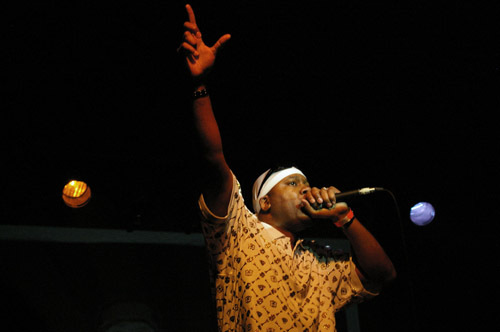 Wolf hit all the right notes, blending Stones Throw staple videos such as Madvillain’s “All Caps” with classic hip-hop like A Tribe Called Quest’s “Bonita Applebum,” not to mention adding a few funk offerings (e.g. Rick James’ “69 Times”). Withstanding some disorderly audience members in the balcony who acted out during this closing set, the 2K Sports Bounce Tour was noticeably well received by the packed-in Chicago crowd. And while Wolf told the audience they had been great, he was clearly equally impressed by his Stones Throw brethren that make up one of the most sonically diverse indie labels in hip-hop. This entry was posted in Live & Direct and tagged Arabian Prince, Guilty Simpson, Karriem Riggins, Madlib, Peanut Butter Wolf, Percee P. Bookmark the permalink.